The 2018-19 ARL Experimental Racing Series, the inaugural Season 1, schedule as been officially released! 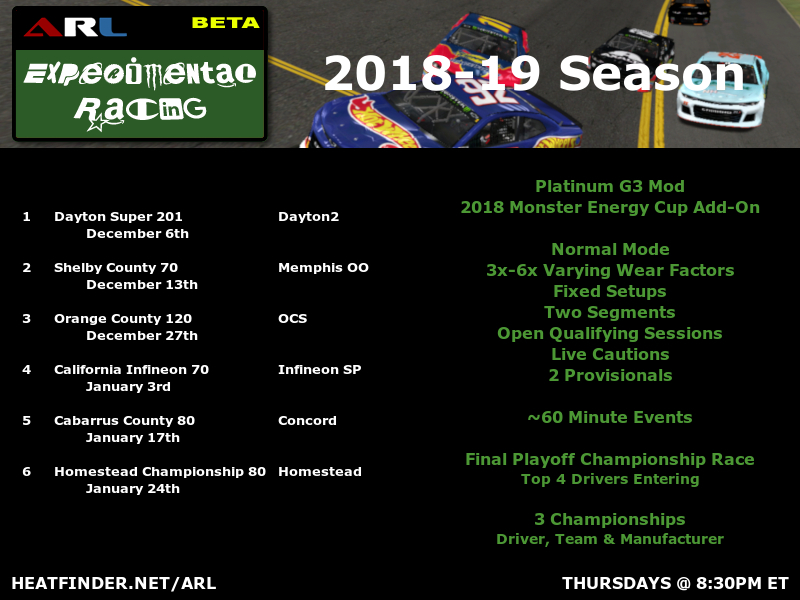 The new series will focus on testing mods, tracks and race configurations not currently being featured in our other active series, you will see seasons from different league directors and many unique styles in the future. This season will be running in Normal mode with varying 3x through 6x wear factors and fixed setups, opening the door for all drivers to show off their skills in identical cars! Open qualifying sessions are returning and each event will feature two segments with live cautions! All races will be run with the Platinum G3 mod and 2018 Monster Energy Cup add-on. Three championships will be up for grabs - drivers will be competing for the overall driver, team and manufacturer championships. 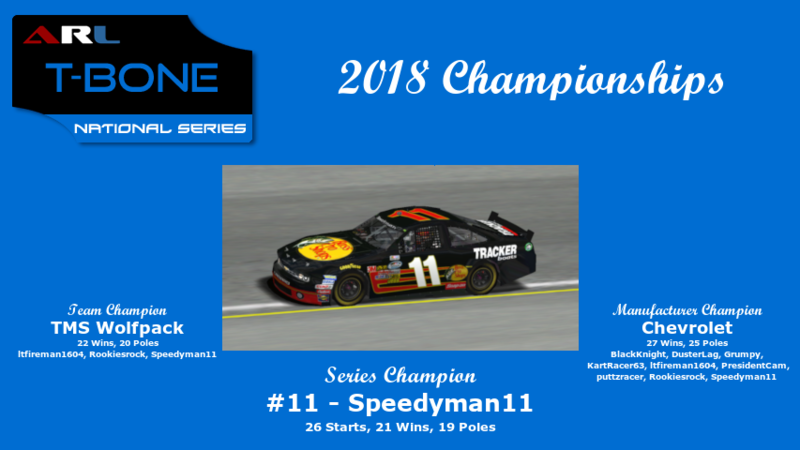 The 2018-19 season kicks off at Dayton2 on December 6th 2018 at 8:30pm ET and will run through January 24th with the Championship season finale at the original Homestead-Miami Speedway track. We will be racing Thursday evenings at 8:30pm ET. Drivers are allowed five custom paints and are permitted two provisionals during the season. We welcome racers of all skill levels and racing backgrounds. Get the Platinum G3 mod here and 2018 Monster Energy Cup add-on here. Please review our rulebook here before your first event. Speedy is now tied with Donaldson for most championships in the league. 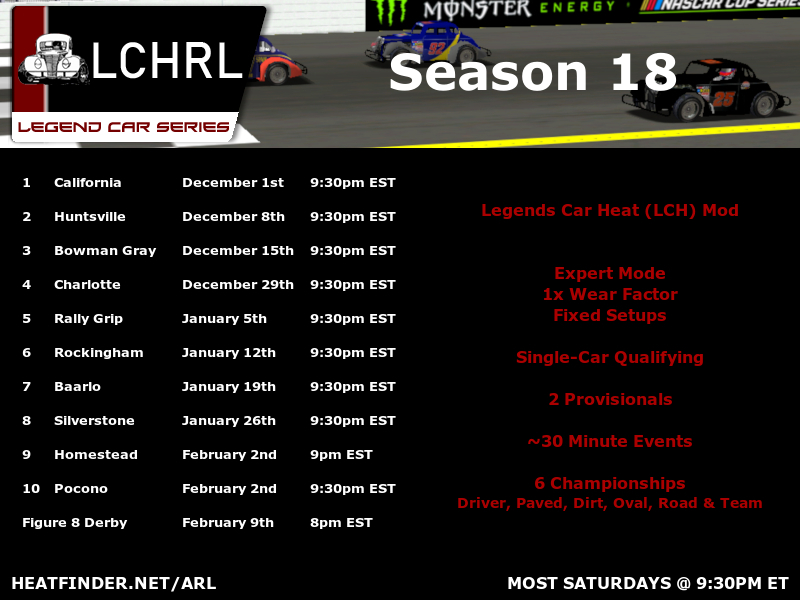 The 2018-19 LCHRL Legend Car Series, Season 18, schedule as been officially released!